Recently renovated and redesigned, full service, beachfront hotel. A unique selection of sleeping and meeting rooms, casual to elegant dining, outdoor pool, whirlpool, and over 3300 square feet of meeting space await you. 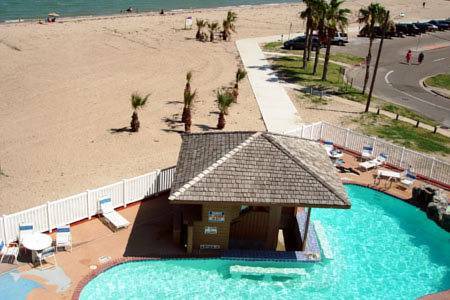 Conveniently located right on Corpus Christi Beach next to the USS Lexington and Texas State Aquarium, all rooms feature a balcony, hair dryer, iron and board, modem hook-up, coffee service, microwave and refrigerator. Caribbean Ballroom: 5 banquet/Meeting rooms totaling over 4,000 square feet. Ballroom and foyer are perfect for wedding ceremonies.